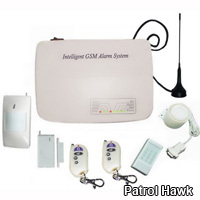 and selling of Patrol Hawk series of GSM alarm system. Patrol Hawk Security is the trusted name in wireless home security. Many homeowners today live in density housing and strata blocks, which limits hardwired home security. Whether you rent, lease or in temporary housing, the Envoy Wireless Home Security Package from Patrol Hawk provides the perfect solution in home security.